The Heidi Cheese line equipment is specially catered to be both practical and useful for all cheese lovers at home. Designed and crafted in Switzerland to last a life time. 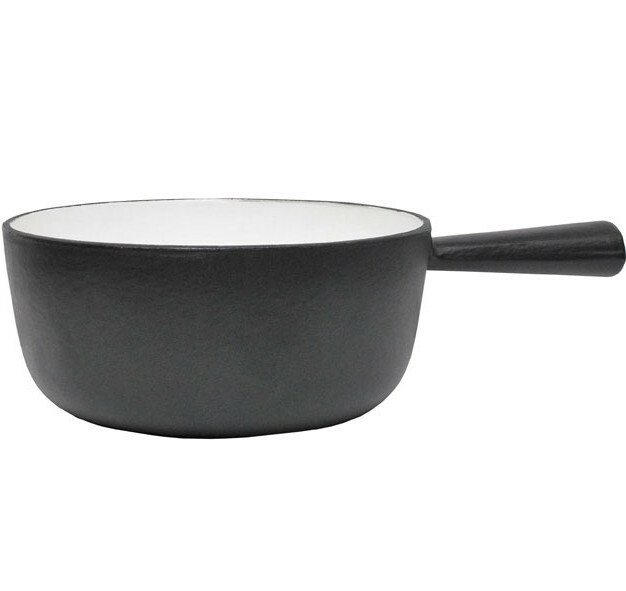 This 1.8L classic black matt cast iron fondue pot with beige enamel inside and round handle is perfect to cater for 3 to 4 people. Pick from our extensive range of burners or simply use on the stove. Set of 2 beautiful 3 dents Fondue forks made of Maplewood. Perfect with our Red Fondue Pot for 2. The Heidi Cheese line equipment is specially catered to be both practical and useful for all cheese lovers at home. Design and crafted in Switzerland to last a life time. We know how much customers love the way that we sample cheese at our Store in Surry Hills – the fine shaving of cheese that develop the perfect flavour & aroma and melt in your mouth. You can now experience the same at home with this professional cheese slicer made in Inox with black handle. A professional tool to scrape off melting raclette cheese of large wedge. Beech-wood handle with one side of the blade micro-serrated. The perfect baker for camembert and Vacherin Mont d'Or style cheese. The perfect gift for a cheese-lover chef. Made in England by Fine Cheese Co.
Set of 6 Appenzell design fondue forks with 3 dents, black handle with silver Appenzell design (cows and cow's keeper illustration). Perfect to use for any type of cheese, this Inox cheese knife is a must have tool to have in the kitchen drawer for a last minute cheese/antipasto board or a single cheese snack. The must have tool to cut perfect even slices of raclette cheese out of a big wedge. Rubberwood handle and adjustable cut thickness. A set of 6 red Fondue forks Swiss Cross design. Pick from our extensive range of burners or cast iron fondue pot to complete your set. This 100% untreated set of 2 slates have 4 small felt feet under each, making entertaining a breeze. Easy to grab out of the table, cheeses will be beautifully displayed.